Scientists have made a bright discovery – a rainbow-coloured dinosaur! 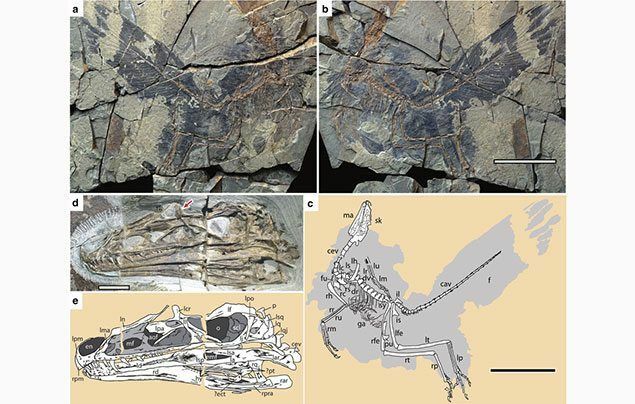 The fossilised remains, unearthed in north-east China, show a bird-like dinosaur that roamed the Earth in the Jurassic Period, 161 million years ago – woah! Scientists have named the duck-sized dinosaur Caihong juji, which means ‘rainbow with the big crest’ in Mandarin. What Caihong juji may have looked like! 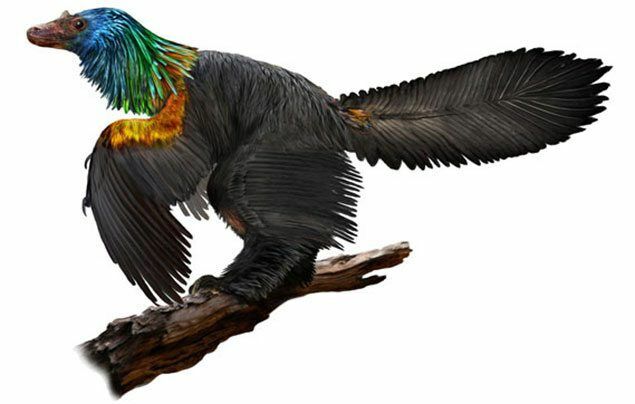 The dinosaur had a bony crest on its head and long, ribbon-like feathers in a rainbow of colours, which scientists believe would have shimmered in the light. After studying the feathers under powerful microscopes, they found that the dinosaur’s melanosomes (microscopic granules that give cells their colour) were similar to those in modern-day hummingbirds! These images show how the pre-historic animal was preserved. Despite its feathers, it’s thought that Caihong juji wasn’t built for flight. Instead, the bright plumage may have been a way of attracting a mate, like the tail-feathers of the modern-day peacock. It certainly would have been an eye-catching display! What’s your favourite dinosaur? Let us know by leaving a comment, below! Dinosaur Interview with Steve Brusatte! We catch up with dino-expert Steve Brusatte to learn about our prehistoric world! Ancient ‘unicorns’ may have roamed Earth with humans! Check out the prehistoric “fuzzy rhinoceros”! NG KiDS chats to Dinosaur Expert Jack Horner!